When we visited Norway, we decided to travel from Oslo to Voss doing our DIY Norway in a Nutshell route. 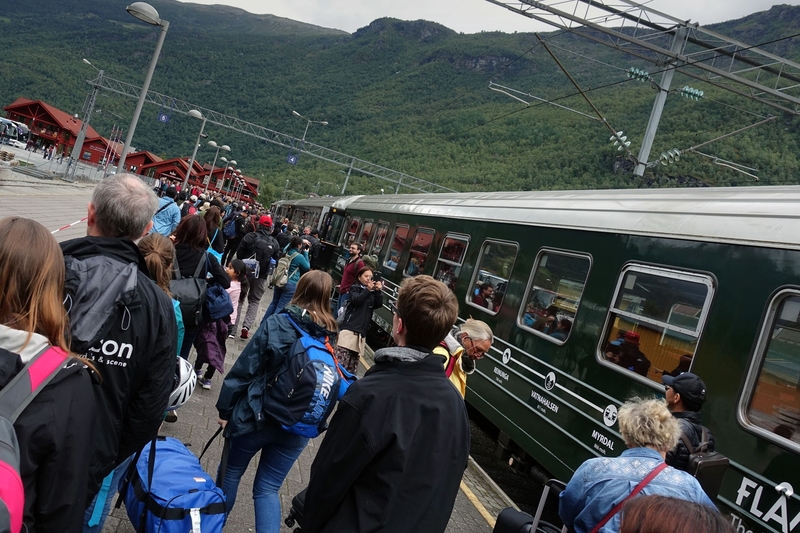 We encountered a slight blip on the first leg of the journey however (the train from Oslo to Myrdal), just before we were due to arrive at Myrdal, the train stopped. Initially we thought it was just a routine stop waiting for a platform or something to become available at Myrdal but then the engine turned off and the lights turned off. At this point we became a little concerned but there was still plenty of time to catch the train from Flåm as we had a half an hour buffer between arriving and departing. Time dragged on however and we remained at a standstill about 10 minutes out of Myrdal. We didn't receive much information from the conductor either - just that the train was currently making an 'extra stop' (a lovely euphemism!). 1.20pm came and went and we then started to panic about making the next train, when the train hadn't moved at 1.30pm we resigned ourselves to the fact that we had missed the connection (which was at 1.27pm) and started to try to make contingency plans. 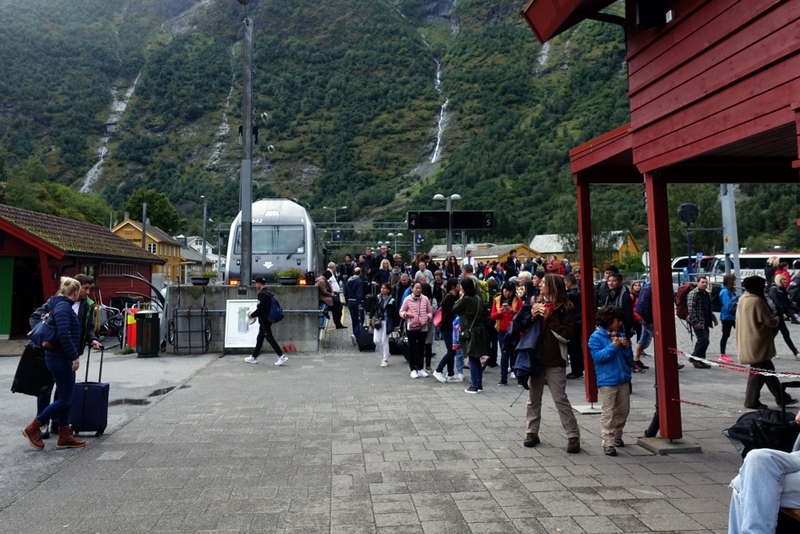 When finally the train started to move at 1.40pm we were pessimistic but on arrival into Myrdal train station, we were very happy to find the Flåm train sitting waiting for us! 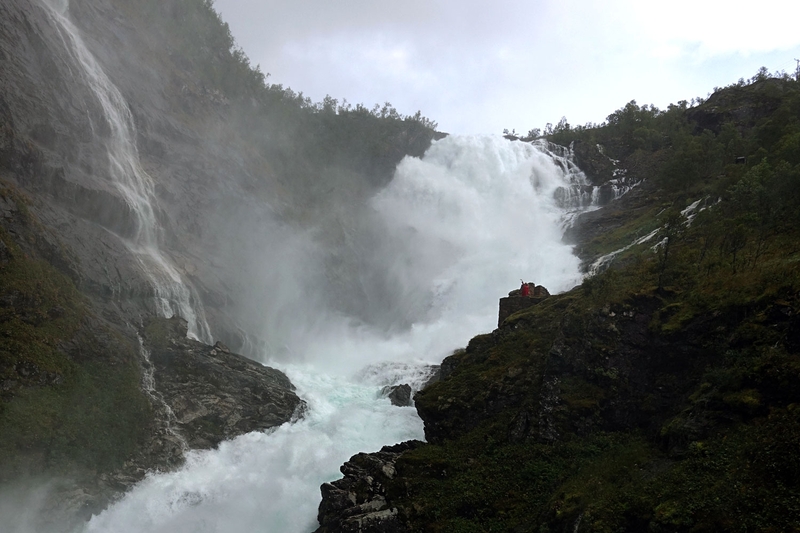 The only compromise we had to make was not stopping to get out at the waterfall on the Flåm railway which was definitely a compromise I was willing to make if it meant being able to continue on the rest of journey. Sorry waterfall - we have a boat to catch! This turned out to be the pattern for the rest of the day - if you are travelling on the standard Norway in a Nutshell route (either booked through them or DIY) each leg of the trip seems to wait for the previous one to arrive so there is no need to stress or panic if you become delayed on one portion of it which is comforting to know! We made it - yay!